2018 Chris Janson "Friend Party" On Sale Now! 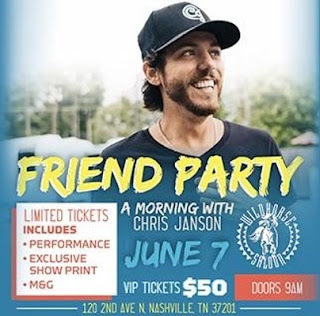 Chris Janson will hold his annual fan club "Friend Party" on Thursday, June 7, 2018 from 9 am to 12 pm at The Wildhorse Saloon during the 2018 CMA Music Festival! The party includes performance, meet & greet, and an exclusive show print! Click here to see our complete list of 2018 CMA Fest Fan Club Parties!